Engaging take on the ‘parallel worlds’ trope, with an unusual magic system that is full of surprises. Filled with compelling characters this novel is a great start to the series, a taste of delightful subterfuge to come. 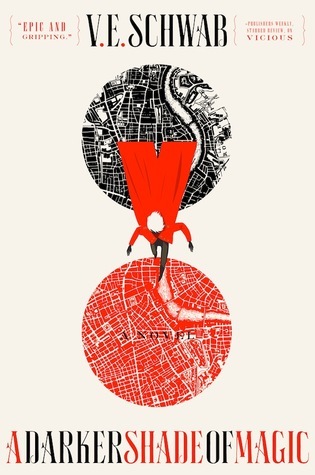 A Darker Shade of Magic follows the adventures of Kell, one of the last ‘travellers’ with the ability to move between the parallel iterations of London. Officially he is a messenger carrying letters between the rulers of the different Londons, including to our own world, in the time of King George III. Unofficially he is a smuggler, swapping trinkets from the different worlds, something that is strictly forbidden. A chance meeting brings him into the orbit of Delilah (Lila) who is our second protagonist, a petty criminal and aspiring pirate. Their fates become entwined, but don’t imagine for a moment that this is a YA love story with a tiny layer of magical background, if you’re looking for an angst-y love story this isn’t the book for you! There was a lot to love about this novel. It really ticks all the boxes for a YA fantasy series starter; a likable but morally conflicted protagonist (times 2) with dead parents (also time 2), an ancient ‘dark’ threat almost forgotten by all, political intrigue, plenty of creative world building, and of course, the YA fantasy staple, a masquerade ball. Lila is far and away my favourite character in the book, she brings much needed humour with her sassy one-liners, and emotional complexity as she struggles to be who she wants to be in a world stacked firmly against her. I loved watching her grow, and her depth really put Kell into perspective, he rarely came out the victor in terms of character development and progression. Hopefully book two will give Kell more opportunities to learn from his mistakes. My main critique of this book centres on some of the stylistic choices in the writing. These are personal preference and I can see how others would enjoy then, though I found them grating at times. In addition to the dual perspectives of the protagonists there are many short snippets from the perspective of various antagonists, side characters and occasionally a random observer. While these short chapters are an interesting way to reveal information to readers I felt they didn’t add much to the experience of reading the book. In fact more often than not when I noticed that it was one of those chapters next I put down the book for a while. The protagonists needed to learn that information anyway, so it sometimes felt like aspects of the magic system and conflict were over-explained. I also felt like Kell’s characterization was quite weak. Though on the surface he has flaws, they are never really explored: why does he smuggle aside from that he ‘feels like it’? Is his relationship with the Prince and royal family really all roses? Does he have any actual feelings? There was a lot of telling and not much showing when it came to Kell, and I really hope that he gets to shine in book two, as there is a lot of potential for a really great character there. If you love YA fantasy, you’ll love this novel, it’s a great example of all the best and most creative aspects of the genre. Fans of more adult fantasy might find the plot a little simple, and the political intrigue little more than lip-service, but there is plenty to enjoy when it can be taken for what it is. I will definitely be looking forward to A Gathering of Shadows when it is released later in 2016, and hope that Schwab takes the opportunity to build on the creative foundations that have been set in A Darker Shade of Magic. Thanks for the comment! I’d love to visit London one day too… so many great books are based there!